Check out my portfolio for proof! Howdy! I'm Lizzie, a Brighton-based tea-lover, gin-drinker, and all round good egg. ​I'm here to help you sky-rocket your brand to epic heights with copy that converts and content that attracts and traps your ideal audience. Fun facts: I'm an identical twin, I've done the highest bungy jump in the world, and I used to race donkeys (yes, that's a thing). I'm known for my conversational tone and actionable content that doesn't include any vague, fluffy nonsense. I've worked in the marketing world for half a decade and love experimenting with new, authentic ways to promote content (and I enjoy writing about it, too!). So, why should you hire ME of all people? Want to start seeing some results with your content? 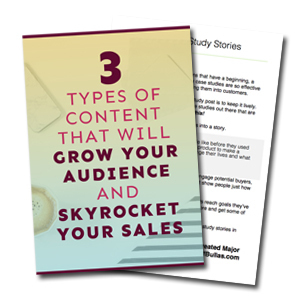 Grab your guide to the three best types of content that will grow your audience and get you more sales. Success! Now check your email to confirm your subscription to get your free guide sent straight to your inbox!